With a pseudonym like "SecretTrevFan", you know you're dealing with a smart cookie. However STF lets him/herself down by doubting my contention that NZ's "mainstream" communist party, the Socialist Party of Aotearoa, controls the National Distribution Union. As STF statesYour minor paranoia that an all powerful neo Stalinist SPA / SUP secret faction controls all this diversity of opinion has no bearing on reality. Sorry STF, but I beg to differ. In my opinion, not only does SPA dominate the NDU, but have used their connections, national and international to play a major role in the long and bitter Progressive Enterprises "lockout". Back in the '70s and '80s, SPA's predecessor the Socialist Unity Party was notorious for instigating strikes. The SUP "owned" the NDU but lost control when Bill Andersen split to form SPA in 1990. This latest industrial action has been a great opportunity for the SPA comrades to relive the glory days of yesteryear and re-flex their industrial muscles. Until his death in 2005, SPA leader Bill Andersen was also president of the NDU. Andersen's offsider and former SUP comrade Mike Jackson was NDU secretary until his recent electoral defeat by Laila Harre. However, virtually all senior positions in the NDU, especially in the North Island, remain held by SPA members or sympathisers. Karl Andersen Bill Andersen's son, NDU Transport, energy, Stores Sector Secretary. 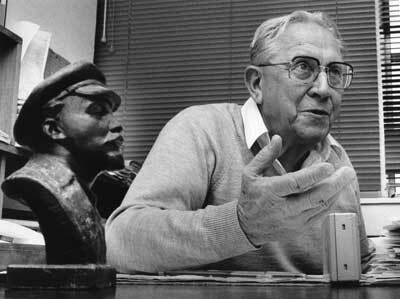 Andersen was a member of a 1986 NZ union delegation which attended the 11th Congress of Soviet front, World Federation of Trade Unions in East Berlin. Karl and his comrades had lunch with East German leader, Erich Honecker, before travelling on to the Soviet Union. Bob Anderson Hamilton organiser, NDU. Sheryl Cadman Wellington regional secretary, NDU. Jennifer Francis Former partner of Bill Andersen, NDU. Administration officer. Former SUP member. Jim Jones NDU Wood Sector secretary. Forme SUP member. Syd Keepa NDU Maori officer. Trevor Noel Whangarei organiser, NDU. Wayne Ruscoe, of the Engineers Union was a key organiser of the anti "lockout" protests in Christchurch. He is a former SUP member with strong SPA connections. Other unions are supporting the NDU, notably the Maritime Union, which has threatened to block Progressive's goods from entering NZ ports. Several leading Maritime Union officials have SPA links. Some also have contacts with the Australian, Maritime Unionists Socialist Activities Association. MUSAA was formed in 1983 from a split in the Communist Party of Australia. About half of the officials of the Maritime Union of Australia are MUSAA members, including most of its leadership. Mike Williams, now secretary of the Wellington Seafarers branch of Maritime Union has both SPA and MUSAA connections. He attended a MUSAA conference in Perth in 1999, one of two international guests, the other being Sinn Fein leader, Gerry Adams. Mike Williams also endorsed the Workers Charter Movement in 2005. The WCM is a coalition of several Marxist groups including UNITE, Radical Youth and Socialist Worker. SPA's Jennifer Francis is a member of the WCM executive. Williams also wrote an obituary for Bill Bodenham, former Australian Communist Party member and national president of MUSAA, in the March 2006 MUA journal, "The Maritimes". SPA also has very close official ties to MUSAA. SPA leaders Warren Brewer and Brendan Tuohy are on the Editorial Board of "The Spark", journal of Trans Tasman Socialist Secretariat, an organisation comprised solely of SPA and MUSAA members. SPA also has close ties to the Communist Party of Australia which in turn close links and some cross membership with MUSAA. It is interesting that the Maritime Union of Australia's secretary, Paddy Crumlin has shown a keen interest in the NZ "lockout". Crumlin has threatened to use his industrial muscle to stop Progressive's goods leaving Australian ports. On a visit to NZ last week, Crumlin said that "We will not stand by and see an Australian-based multinational bully workers. This just the beginning." 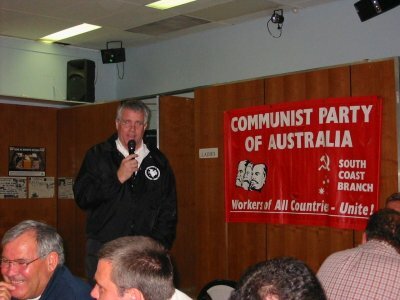 Paddy Crumlin, unsurprisingly, is also national secretary of MUSAA and is on very close terms with the Communist Party of Australia, often speaking at their conferences. Of course all of this may be pure coincidence. SPA may not really have any influence in the NDU and may not have brought any influence to bear on their Australian comrades. Yes and Lenin was really a closet royalist. I am always keen to learn more about SPA. It is a highly secretive and influential organisation that deserves a lot more public scrutiny. So if you have any info, please don't hesitate to email me. As usual brilliant research mate. I find it funny that the NDU are still claming victory in the strike when they said the bottom line would be a single collective union agreement. I think the left are on the back foot here and many don't understand who is exactly behind some of these organisations. Many NZers probably honestly back the NDU for good honest reasons rather than associate with the people behind it all. Yeah clint its pretty easy to feel sympathy for low paid workers. Unfortunately these union turkeys are using these workers as cannon fodder to re-institute a national award system. I wonder how many days pay laila harre lost? I hope she doesn't have to put the vineyard up for sale. PS Where's SecretTrevFan when you need him? Great blog on health spas. I'm seeking specific information on sanctuary spa so I frequently visit blogs like yours.